The idea of organic foods has become very popular. Maybe they do or maybe they don’t contain more nutrients than our typical grocery store fare. But one thing is certain they are definitely more yummy. Many communities have the availability of ordering organic vegetables from local farmers, And I like the idea of supporting our local farmers! 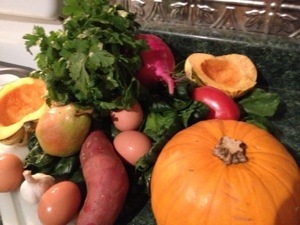 I live near Chicago so I order vegetables from a place called Irv and Shelly’s fresh pics… All the vegetables are from local farmers and I order eggs that are organic from free range chickens that have run around the grass living happy lives. Surprisingly the cost is very reasonable. So I would encourage anyone to check out what is available in their locale. This entry was posted in daily muse, low carb, salad, side dish and tagged Organic, side dish, Vegetables. Bookmark the permalink.